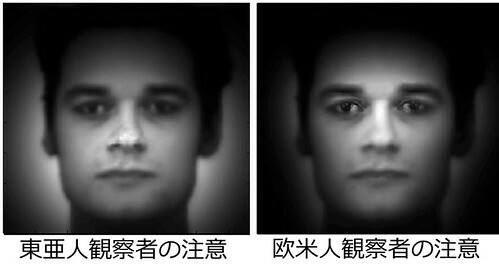 When learning identity, Asians look at the nose and the lower part of the face (above left) whereas Westerners look at the eyes and mouth, triangulating, comparatively focussing more on the upper part of the face (above right). This is the opposite as I would have predicted bearing in mind that Japanese thieves (dorobo) traditionally used a wrapping cloth to cover the upper part of their face (other than their eyes), whereas Western outlaws traditionally covered the lower part of their face with their scarf. It is also the opposite of the part of the face that East Asian and Western children use to recognise emotions. I argue that the way in which emotion and identity are perceived may be swapped East to West.